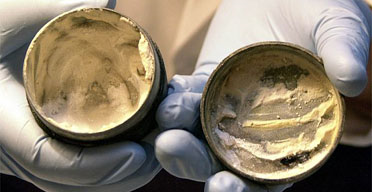 A sealed Roman container was opened today to reveal a 2,000-year-old cream – complete with fingerprints. The metal artefact, measuring 6cm in diameter and showing little sign of decay was unearthed during archaeological excavations at a Roman temple complex in Southwark.It is a fantastic human element to find the finger marks on the inside of the lid,” said Nansi Rosenberg, senior archaeological consultant at EC Harris, the consultancy which is managing the excavation. The imprints could shed further light on whether the pot was used by an adult or child, male or female.